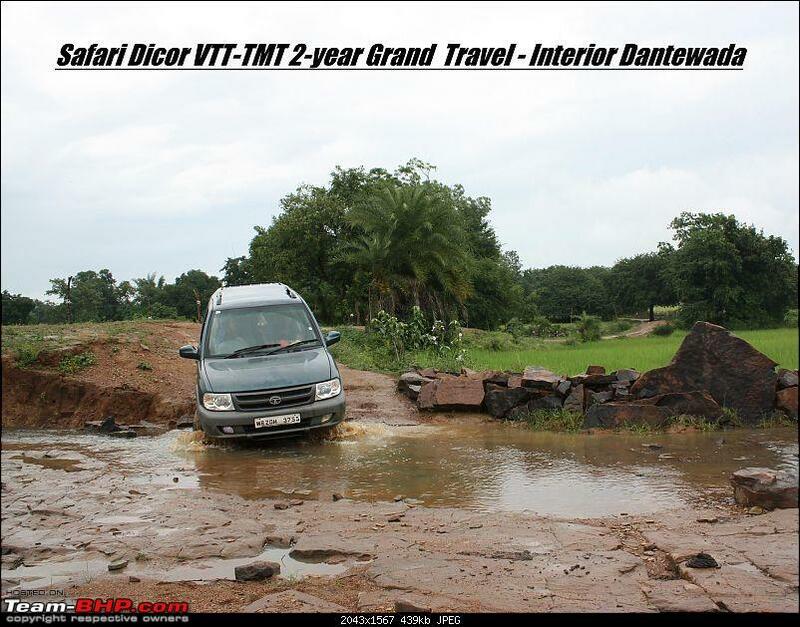 It was on October 15, 2007 when the Tata Safari 2.2 VTT LX was bought, within a day of its release, and it thus became the first VTT on Team-bhp. This 2.2 has had a flawless performance, confidence in it has grown by leaps and bounds -- The way it safely brought us back each and every time from some of the most hostile lands. And contrary to all the premonitions from the false prophets of doom, the 2.2 VTT has and still continues to keep the cynics at bay!! 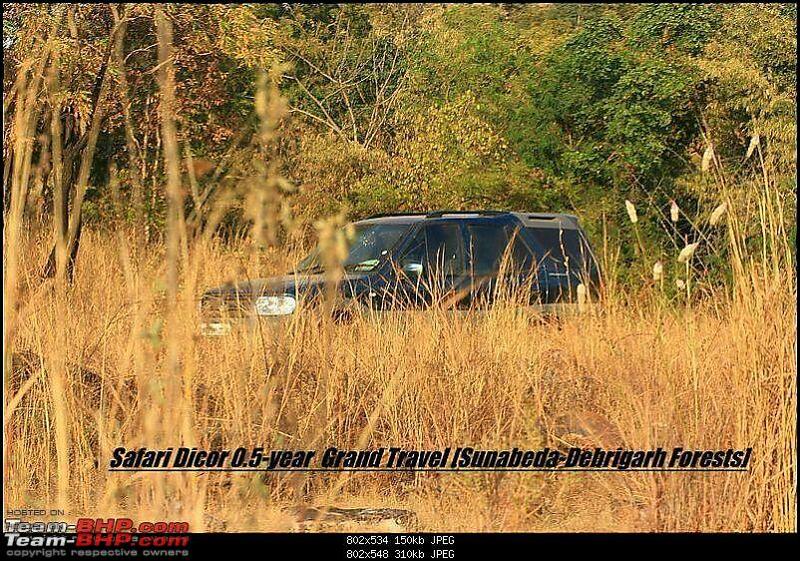 In all these 3 years, the VTT has seen some fantastic journeys, from the very next day North Bengal Forest and Hill tour, to the unknown interior Orissa jungles [Kuldiha & Satkosia], to the rural badlands and wastelands of Purulia and West Midnapur districts of West Bengal, to the 1-year ownership fantastic travel to Kinnaur, Spiti and Lahaul and going to some places were few tourists venture to, and then the amazing overnight journey across the absolute desolate NH6 towards one of most remote and part Maoist affected forest of Orissa [Sunabeda] and the unbriddled joy of finding a hidden waterfall with blue waters and a white sandy beach in the middle of the forest, to the tribal lands of Southern Orissa and Chhattisgarh to unknown forest of North Bihar and a few more. 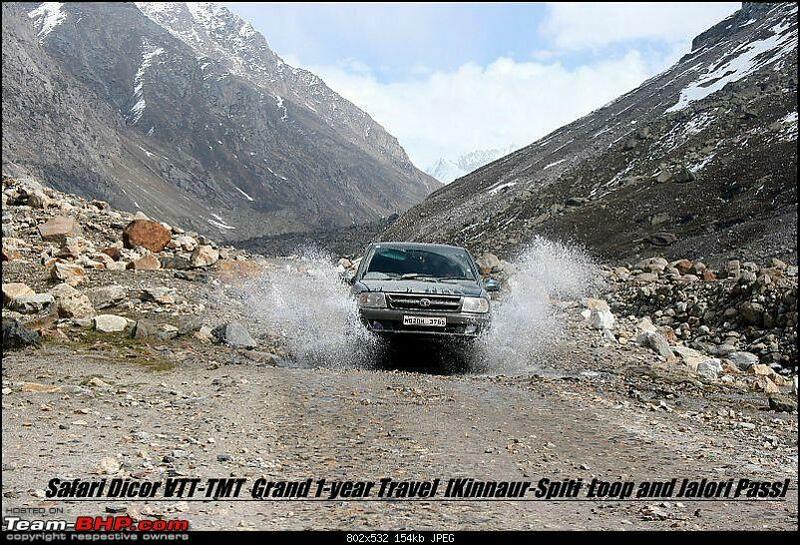 The VTT completed its 3rd year in Oct 2010 and what better way to let it loos than to travel at the high lands of Ladakh and Changthang all the way from Kolkata -- and again safely bringing us[wife, our 5-year-old child, and me ] back as always to base - going through some of the wide extremes of weather - from high temperatures to freezing cold nights - the VTT is stock but raw, the travels dont leave me much leeway to put on much desired accessories. Last edited by adc : 26th May 2011 at 17:08. 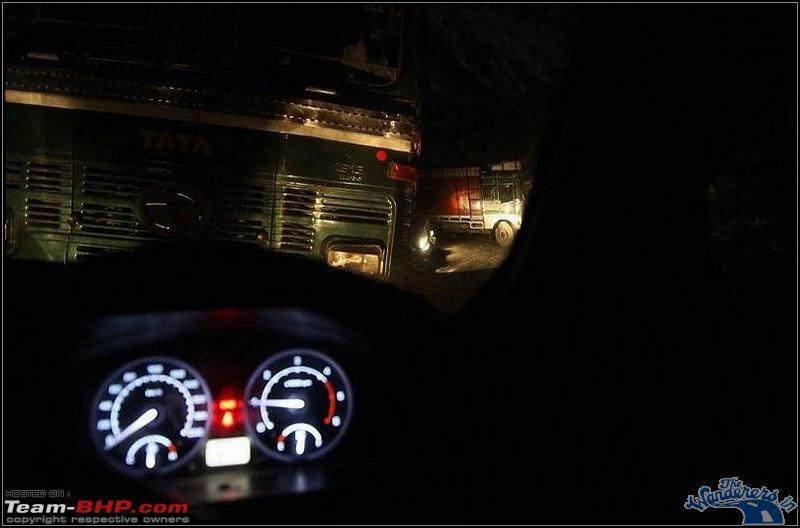 How many kms have you clocked so far sir......? Finally. What took you so long? Been waiting for this t-log for ages! 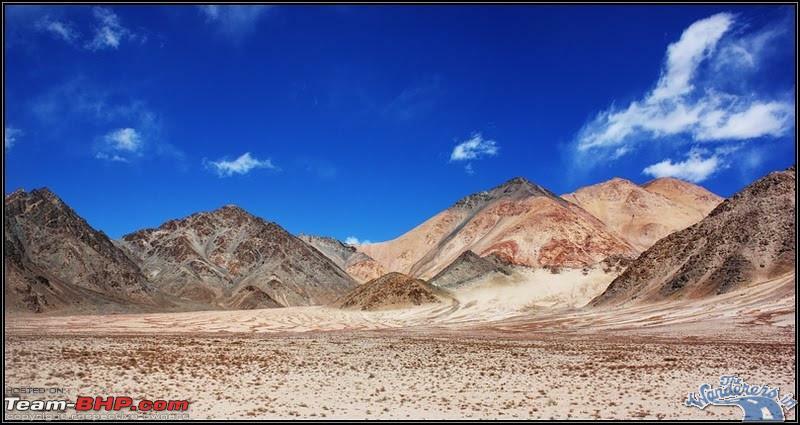 Ladakh, the land of the high passes, the northern most state of India has always been part reality and part fantasy. 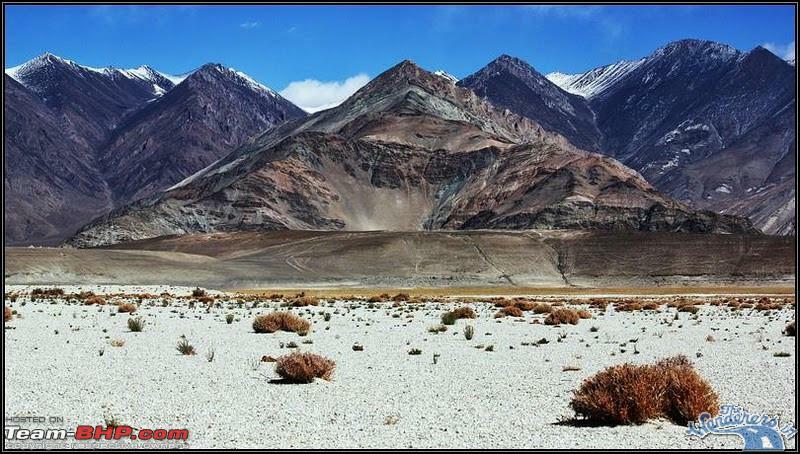 And as we found out, Ladakh landscape brings up the true raw nature as had been through the ages. 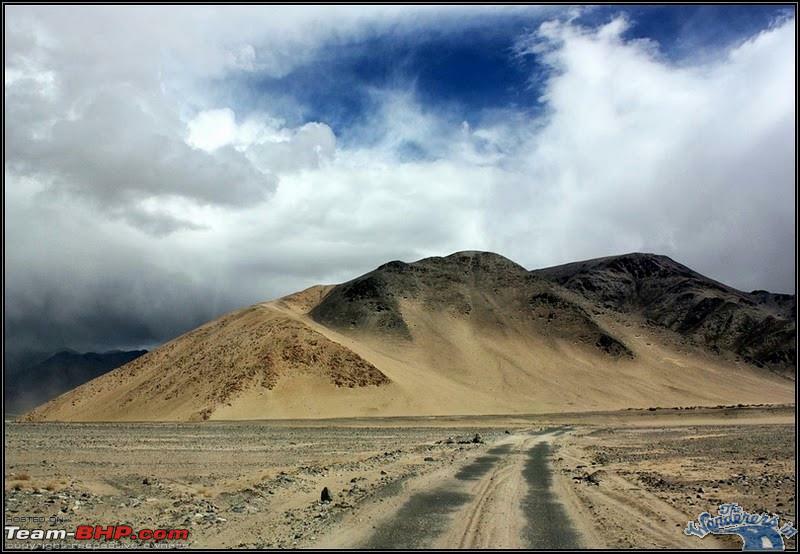 And when we add Changthang to Ladakh we get the best of a travel that one can do in a lifetime. 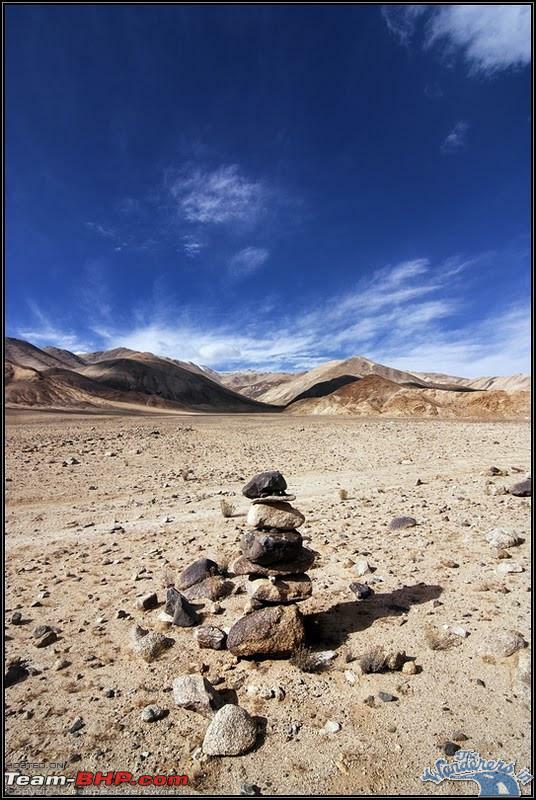 Changthang, is the high altitude plateau of Tibet and and which extends to Ladakh. 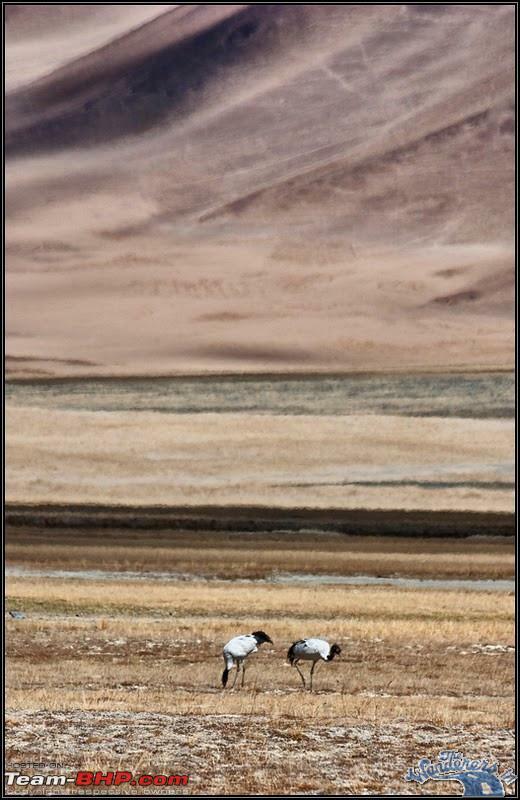 Changthang throws up extremes, unrealistic colours to cold harsh weather to vastness of landscape rarely seen anywhere else. Now what happens when one travels in October? - the "off of off-season" period. 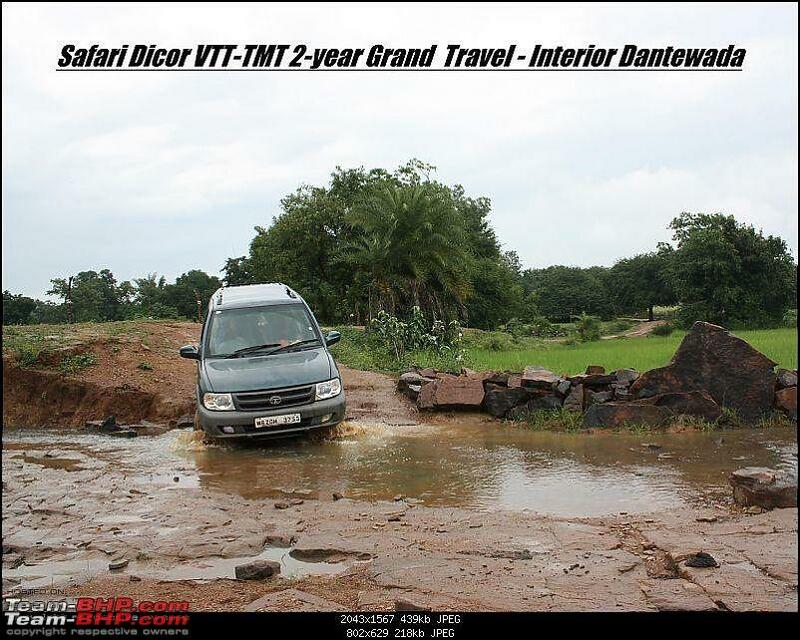 There was absolutley no travel story on the net or print that I came across that said that this is month that one can travel by own vehicle and that too a 2wd. 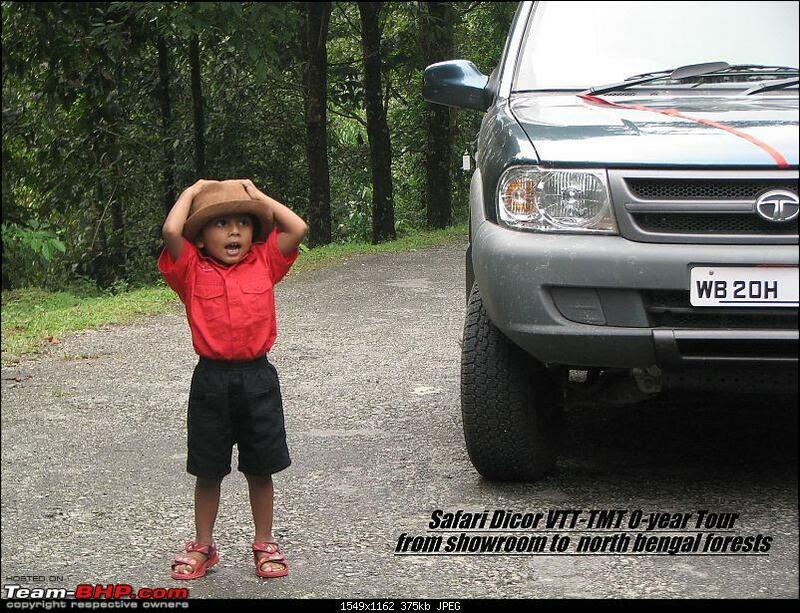 But with Durga Puja holidays starting in October, we had this month of October only and as such we again travel with our trust in Safari VTT 2wd. 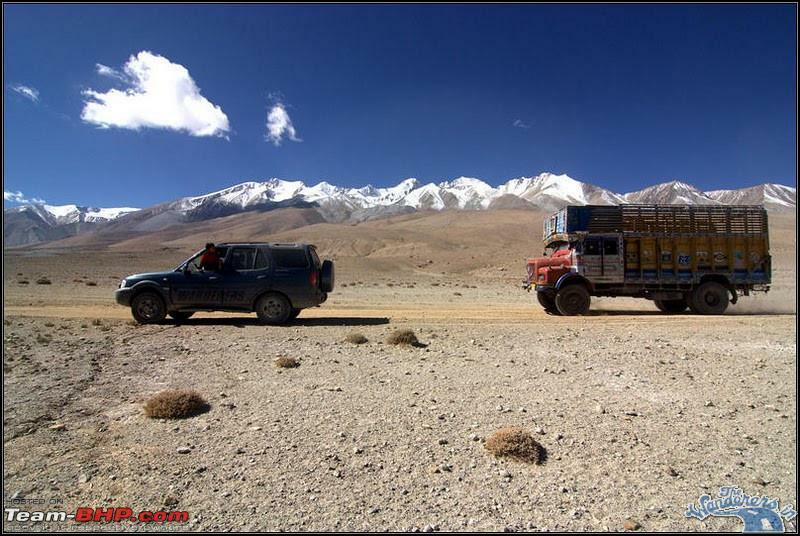 Each and every moment was cherished in this great off-season October travel to Ladakh and Changthang. It has been a very tough but greatly satisfying journey to say the least. As said the memories were varied and diverse but definitely pleasant. 1. The number of people who we met and the great support and openess that we saw in each and every place, whether it be the lonely dhaba we stopped somewhere in eastern UP at 1 am to each and every person we met out there in Ladakh and Changthang. 2. 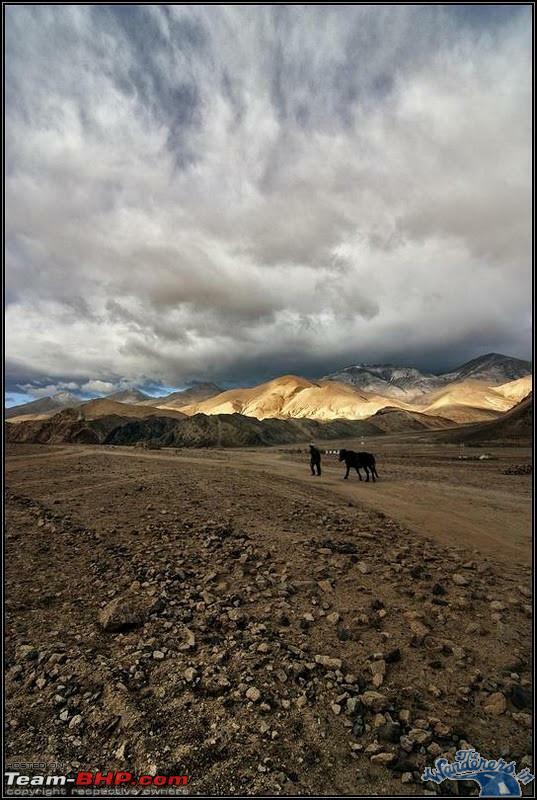 For our interaction with the changpa [nomad] who took a lift towards to Leh and gave his "tent address" - next time we be there, I promised to track him down and move along walking on the more remote places where they graze! 3. For the fantastic gentleman we met in remote Nubra side who personally showed a revolver he bought all the way from Kolkata [!] and then showed us the village Gompa, a beautiful gompa high above the mountains. 4. For the personal invitation to a Ladakhi kitchen at ex-panchayat at Saboo. A day was spent there amongst them, and it was an experience we cherish forever. 5. 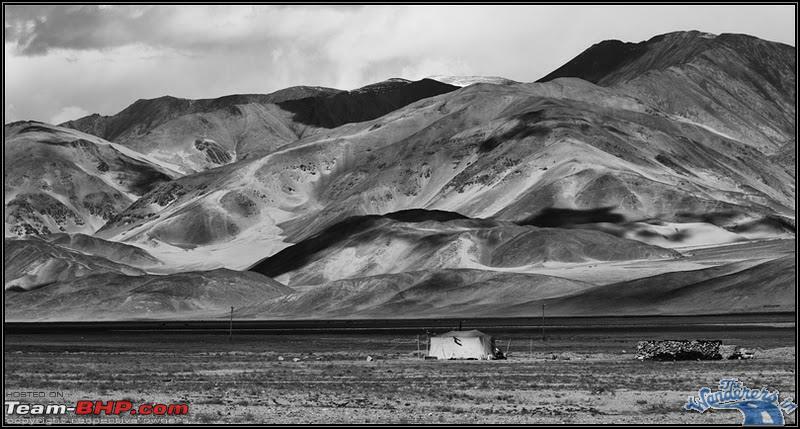 For the amazingly crude yet warm home stays [remember this is way offseason mid October] at Hanle and Fukche/Koyoul, the coldness and the remoteness has to be visted to be felt. At both places, the hostess and host respectively saw to our comfort in that cold in whatever way possible, even if it meant giving the new blankets to us they had just bought for the winters. 6. For the invitation at Dah for a festival that takes place once in 3 years and then welcomed to stay with one of village citizens in their house, though they had guests. Gestures and memories that still touch our heart. 7. For the absolutely disciplined lone soldiers that we met at the frontier posts, surprised to see us with a child and vehicle out there roaming around places where no tourists go! 9. For some absolutely great memories and experiences with truck drivers we spent 2 days and 2 nights at Zojila top, pushing boulders with them to repairing trucks to sharing cigarettes and bidis and tea and biscuits. 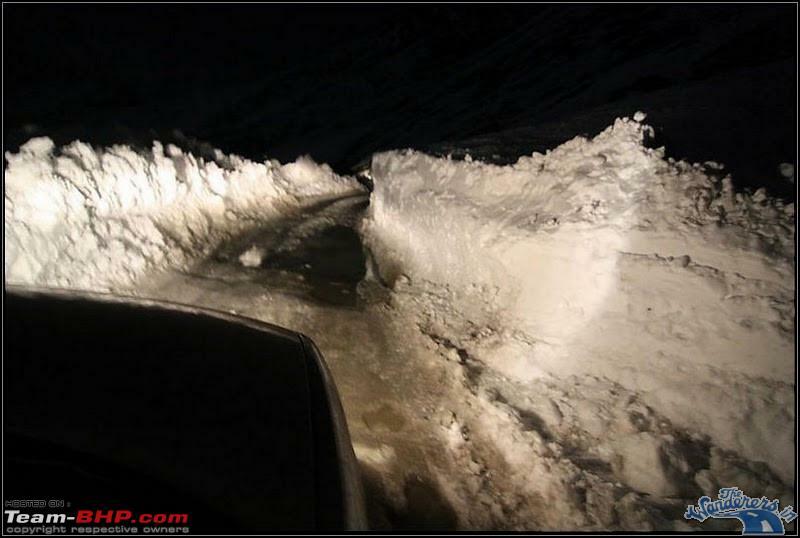 - yes we were stuck on the top of Zojila at 12,000 feet for 2 whole nights. 10. For the Kashmiri toll collector of Sonmarg, who after hearing that we not eaten enough for 2 days and nights as we were stuck at Zojila, hastely arranged for some bread and tea at 5 am in the morning as we came down from Zojila to Sonmarg. 11. 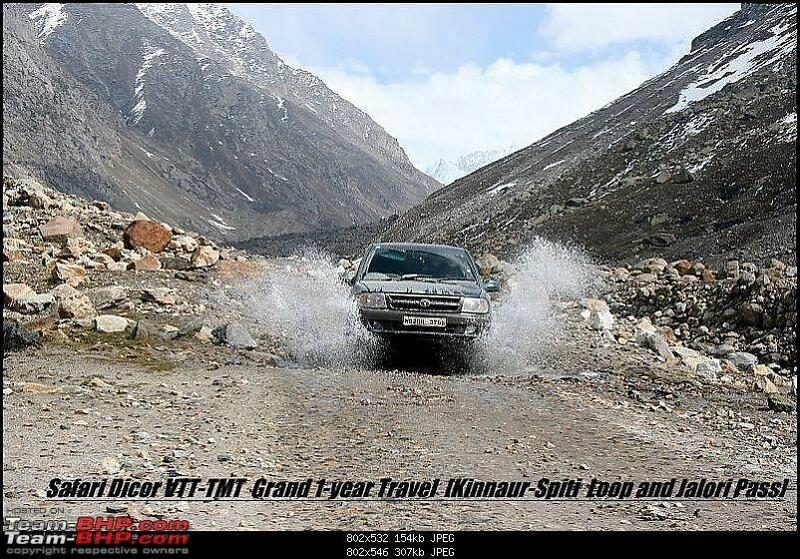 For our vehicle, Safari LX 2wd VTT, for going through all that was thrown at it, from the non-stop 1600 km journey from Kolkata to Delhi and also return in 20-22 hours to the way it went through all the ice and slush at the most remote altitudes, and the best of all, idling for continuous 48 hours as we were stuck at Zoji la with heater on. 12. A special mention goes to our 5-yr-old son for enjoying the journey as much as we do, even while stuck at Zojila or the extreme coldness at Fukche/Koyoul or Hanle. It is his wonderful temperament that goes a long way in making the journey so much enjoyable. 13. And quite a few members of different forums and of course from Sutripta -da who lend us his GPS and which we conked out Hanle, to Nandi with some important updates regarding weather, to Kaustabha who we met we were entering Kolkata after a 25-day gap. 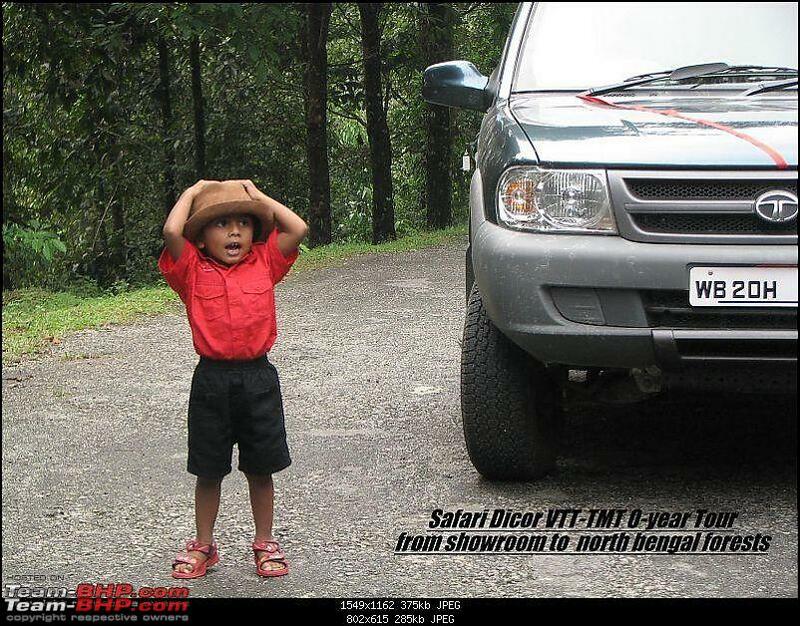 Also this journey was significant in a way that all those debilitating car loan EMIs were ending. It was a 3-year loan, hoping to finish it off as quickly as possible, but then as it happens one just scrapes through a 3-year period. 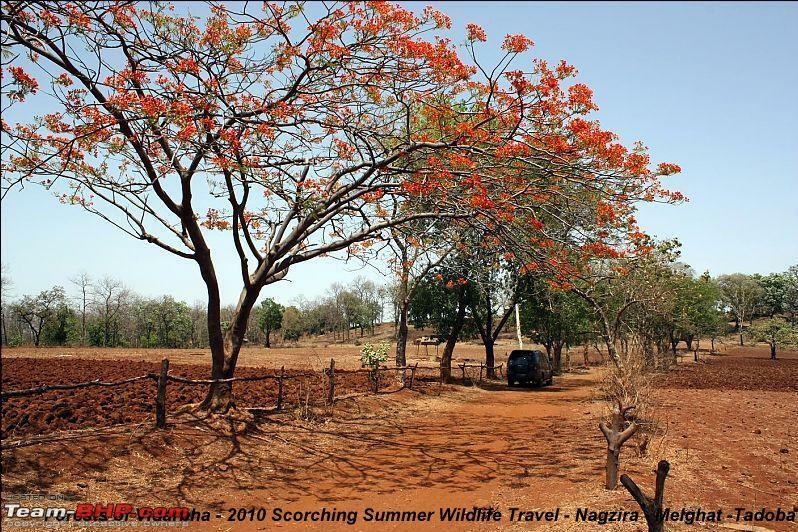 A natural extension of a traveller in most cases is photography, and it is landscape for me but then during our last decade 2 mp digital cameras were just coming on and film cameras were costly, so cameras just did not come into horizon and those days were the Enfield days! Last year though I had bought the Canon 450D with the kit lens 18-55 and a off market 55-250 mm, it was stuck mostly in auto and sometimes in AV mode [we all know that what a quicksand pit photography is] and as we finally got rid of all the EMIs over a 10-year period and that included a new Bullet to this Safari VTT, finally it was time for a new Tokina 11-16 lens as we headed off for Ladakh. At least hoped some better pictures, anyway better way to start some photography other than at Ladakh. 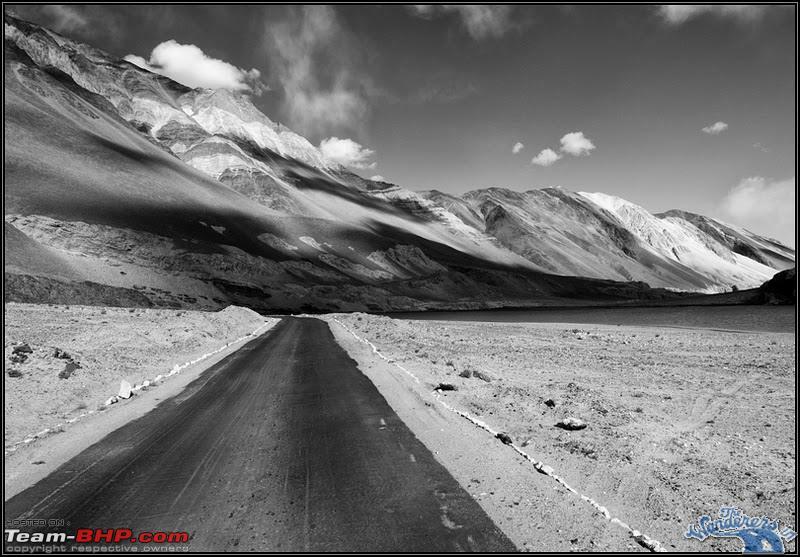 This journey also does put up the fact that Ladakh and even Changthang is possible in the month of October with a bit of luck. 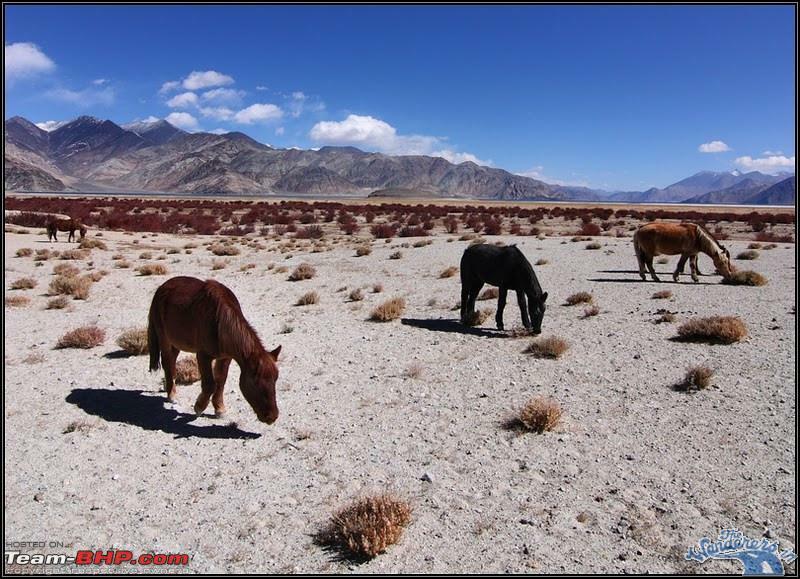 Though cold and desolate, a great boon for off-season travellers like us. Also while going, was surprised to hear Chandrataal lake wasnt iced up, so made a dash for it - and what desolate it was!! A special mention does go to some great travellers out here [including of course hvk] to vardhan harsh's [fantastic detailed trip writer] and Tanveer's exceptional Ladakh travelogues as well as that of Ramky1 - all of them some painstakingly created some unique road maps of that region. 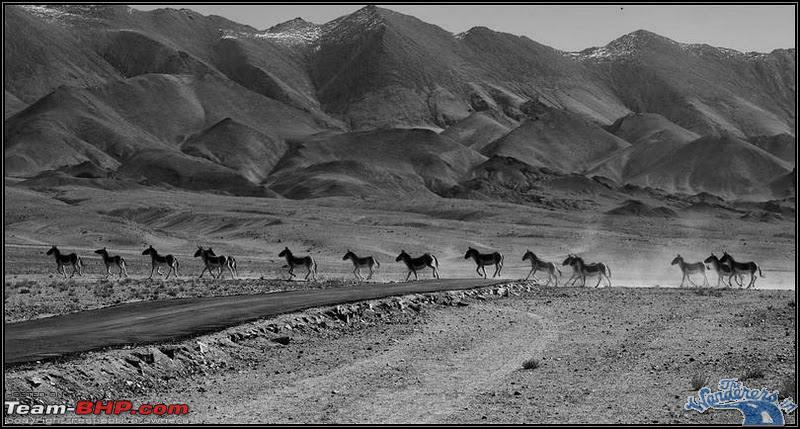 Thank a lot to you guys for bringing up such trips ever and ever again- just not only Ladakh. 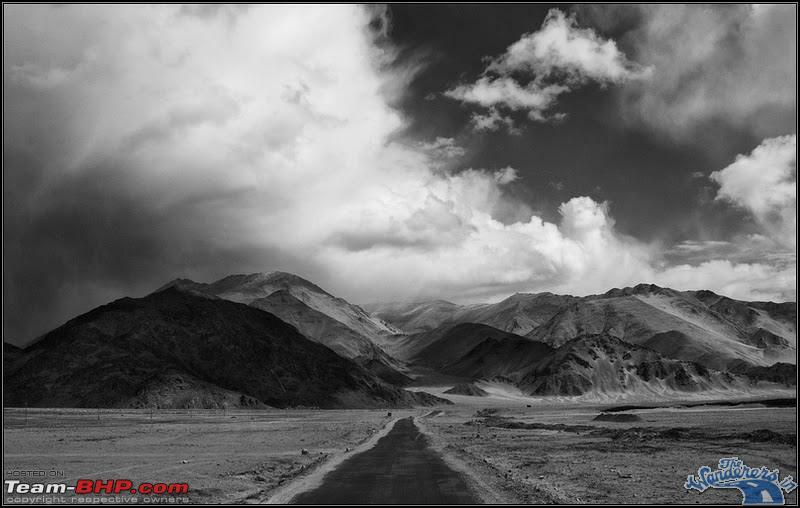 Ladakh is all about pictures. Before I go into details and numbers all, let's just celebrate some highlight pictures. 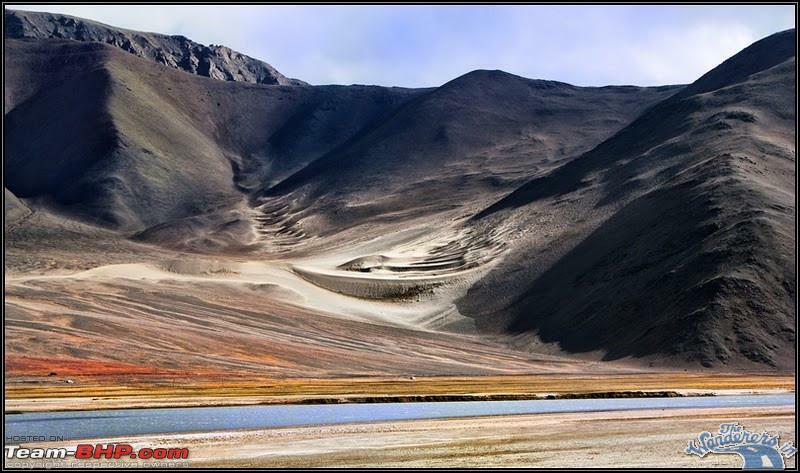 All of out here and wherever, you gotta go to Ladakh and Changthang once! 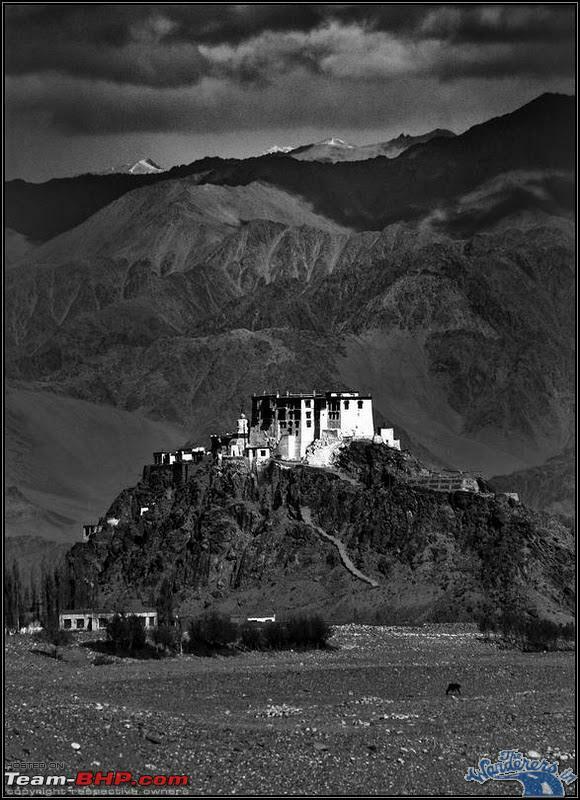 of course Zanskar should not also disappoint to say mildly. Last edited by adc : 26th May 2011 at 17:51. ADC waiting for this travelogue since long and hope to read the same in one go instead of part by parts and wishing you & your family(Including the King) to burn more rubber and bring us more adventurous travelogue. 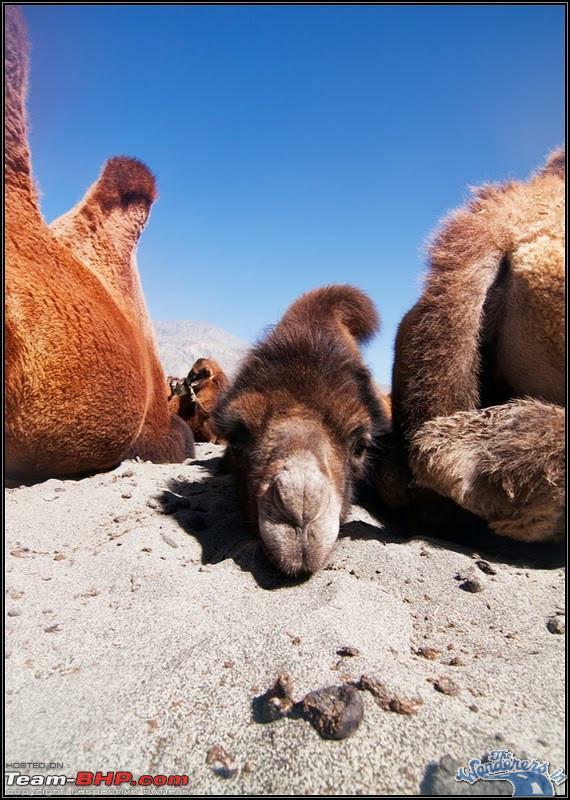 So, for now, let some highlight pictures of Ladakh and Changthang roll before we start on the journey and details. Not following any specific order or sequence, but each image tells a story of place that we visited to a person whom we met. 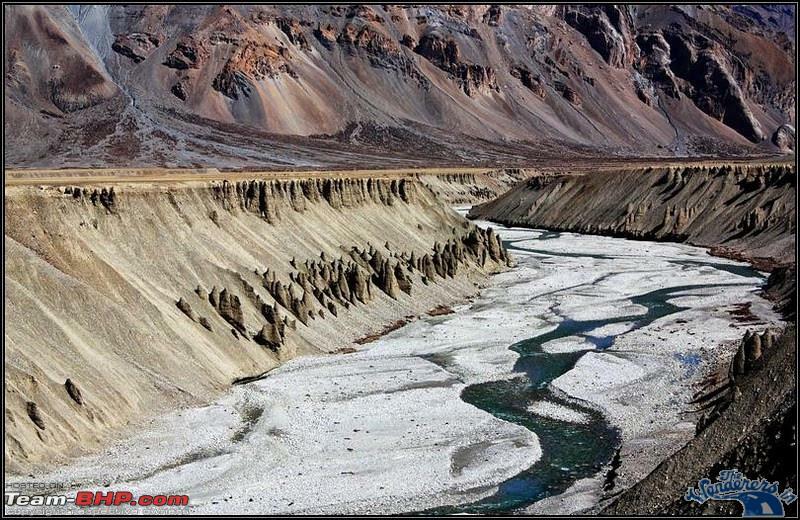 Barren Colour: Meandering north-flowing Yunam river cutting through the Sarchu plain, India. 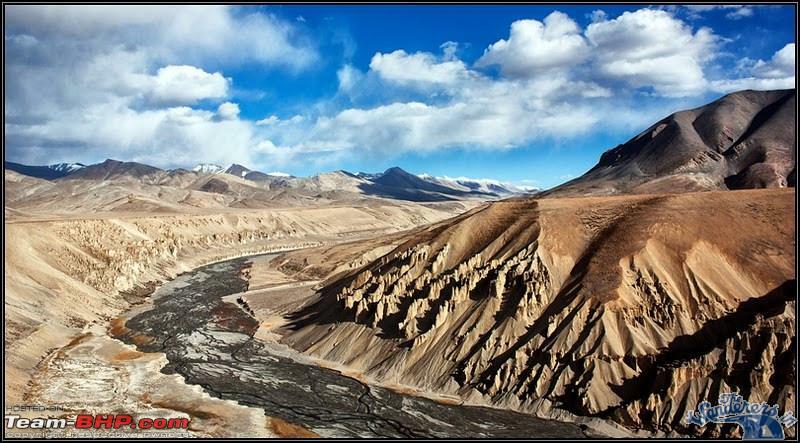 Wind-eroded gravel bed projects as pinnacles as the dramatic landscape unfolds along the high plains of Sarchu to Pang. 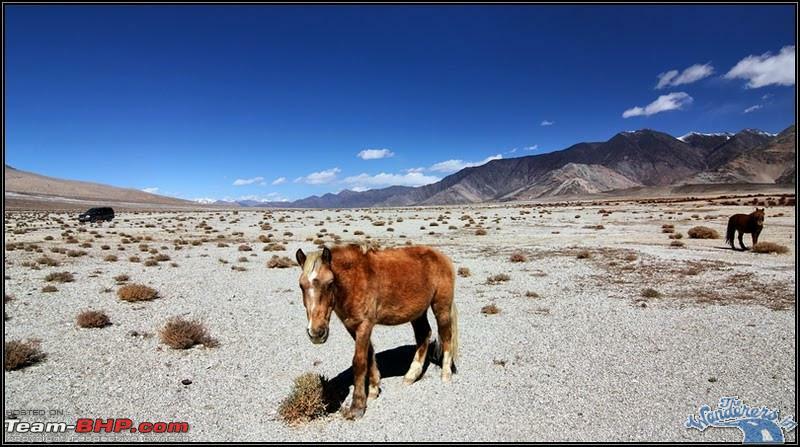 Cold Desert, Changthang: At the tiny village of Koyoul, India, close to China border, leading his horse to camp through the rough weather of the cold desert of Changthang. 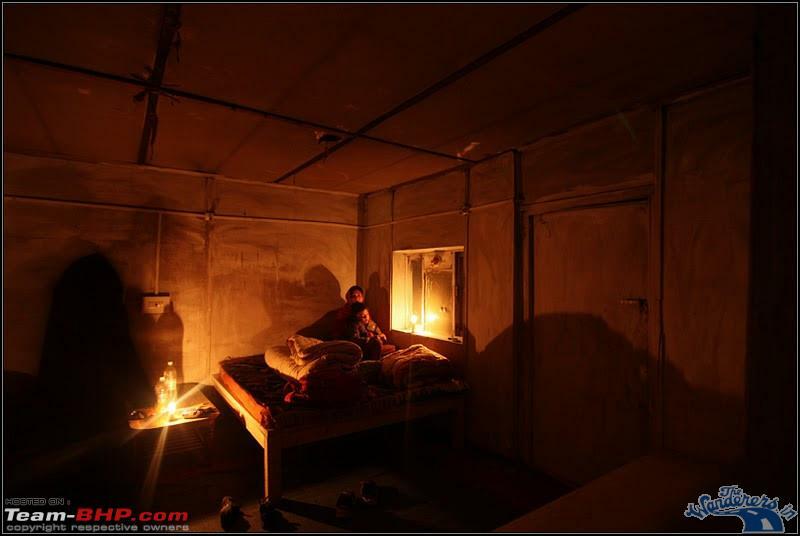 On a late October cold night and with strong winds sweeping, wife and child roughed it out in a tin shed as I kept the car engine running to prevent diesel freezing. Early morning I see him leading the horse through inclement weather, their stances showing the wind strength. The burst of rising sunlight through clouds symbolized his mental strength. A nomad has to go out everyday with his livestock to graze, no days off whatever be the weather. 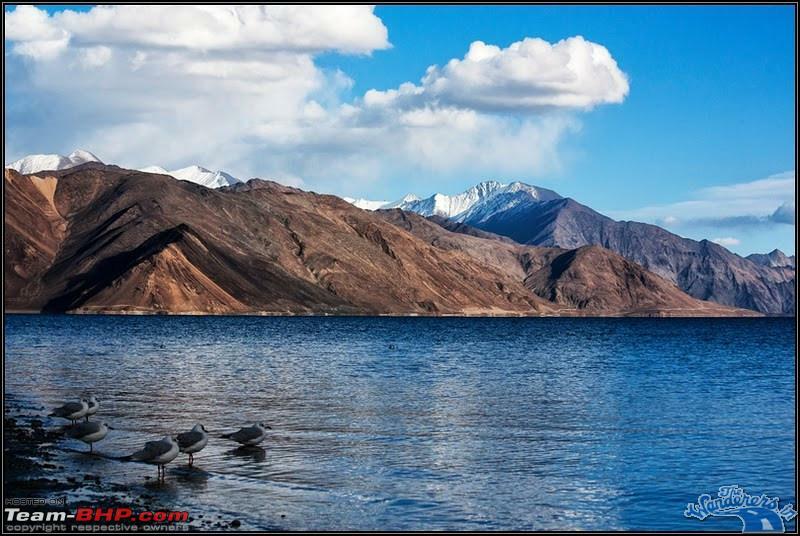 Pangong Lake at dusk, the blue water leaves a mark in your mind forever. 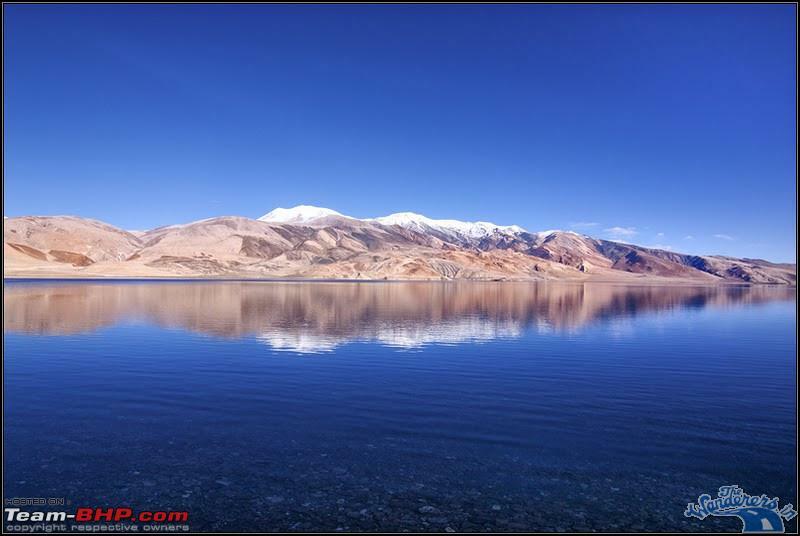 Tso moriri Lake glistens in wonderful blue colour, late evening. 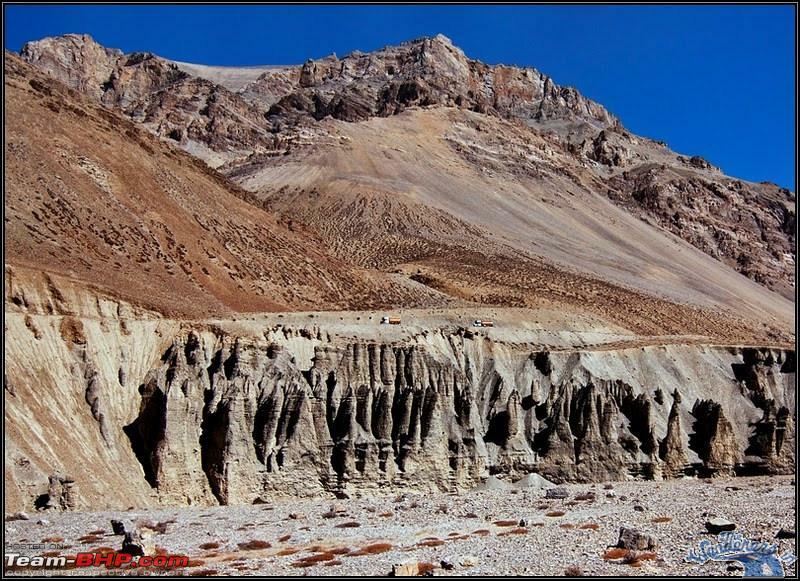 Dramatic landscape along the Fukche to Demchok track. 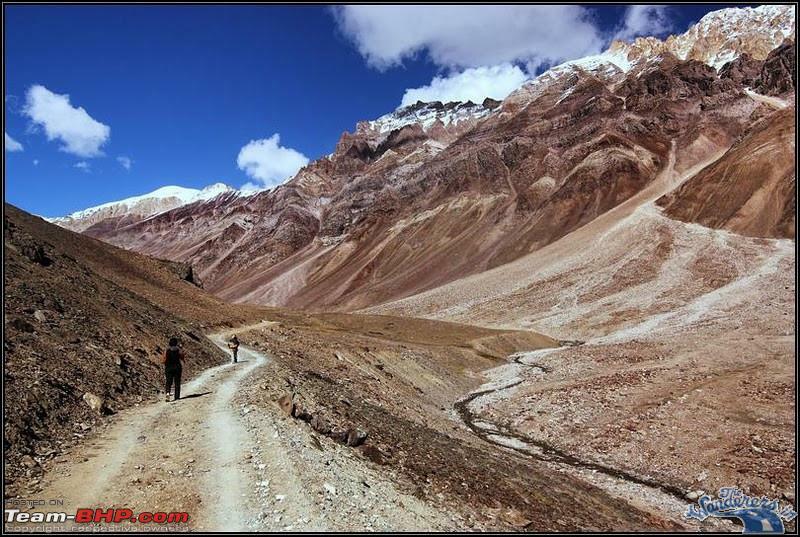 Demchok is the ultimate border post, sector south of Aksai Chin, in the Ladakh district of India. Dah Festival - We were very much pleasantly surprised as we visited Dah village on the last week of October. A village festival was going on, a mela that takes place once in 3 years. 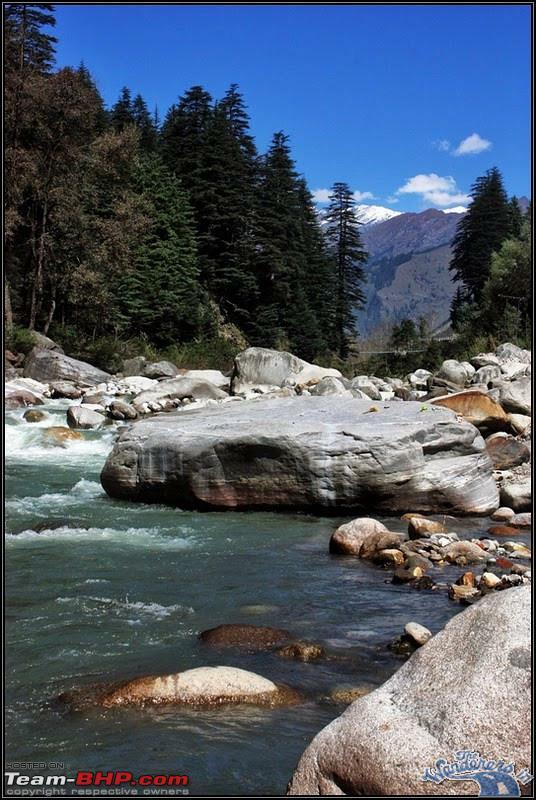 On hearing that Chandrataal Lake [Lahaul] may be possible, took a turn at Gramphoo and went towards the Lake. Wife and child as we trek 3 km from the "car park" along with a local. The road to Chandrataal Lake in October has been the toughest and most dangerous drive till date for me, other than a backing up drive on the ice floor top of Zoji la at 3 am, stuck for 2 days, 2 nights. 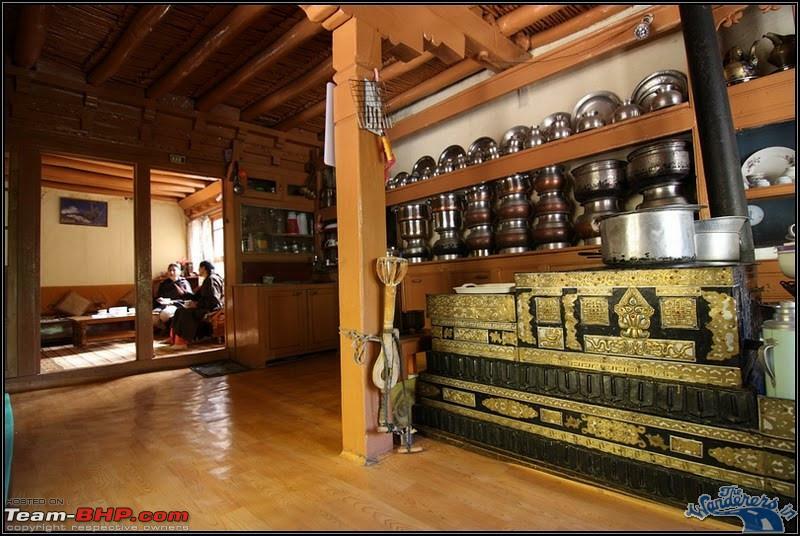 A first hand experience and sight of an authentic Ladakhi kitchen. We were here on an personal invitation of n ex-panchayat and his wife at village Saboo. A day was spent there amongst them, and it was an experience we cherish forever. 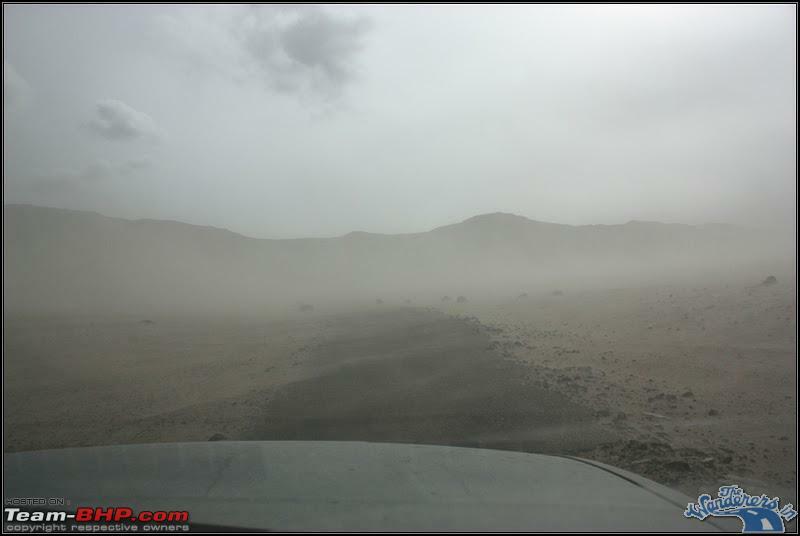 Changthang Kiangs [wild ***] dart across the desolate Loma to Hanle road. Asmita and Anik[bambi], wife and son, rough it out at just below zero temperature at a temporary tin shed at the village of Koyoul as strong winds shook it all through the night. I had to stay in the Safari with engine idling from 3:30 am as diesel was freezing fast, there's no homestay in that village. Last edited by adc : 26th May 2011 at 18:11. Superb adc. 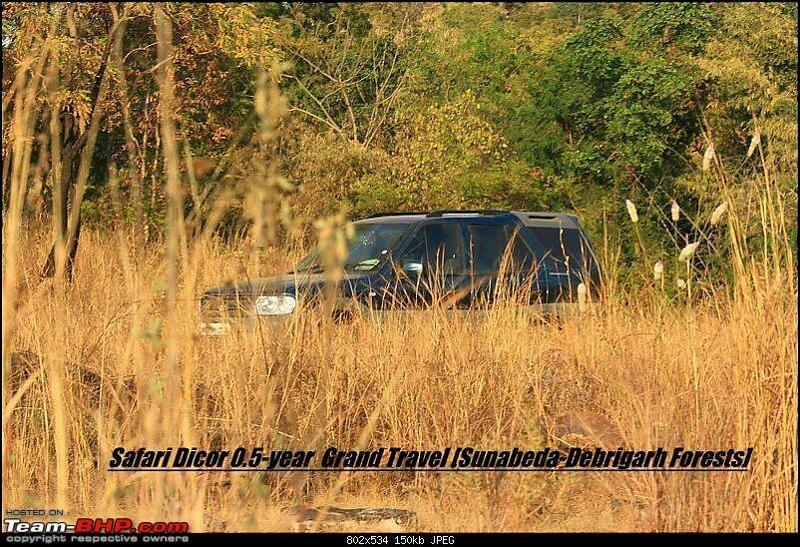 I should say its been a "Poora Paisa Vasool" for you on this Safari. 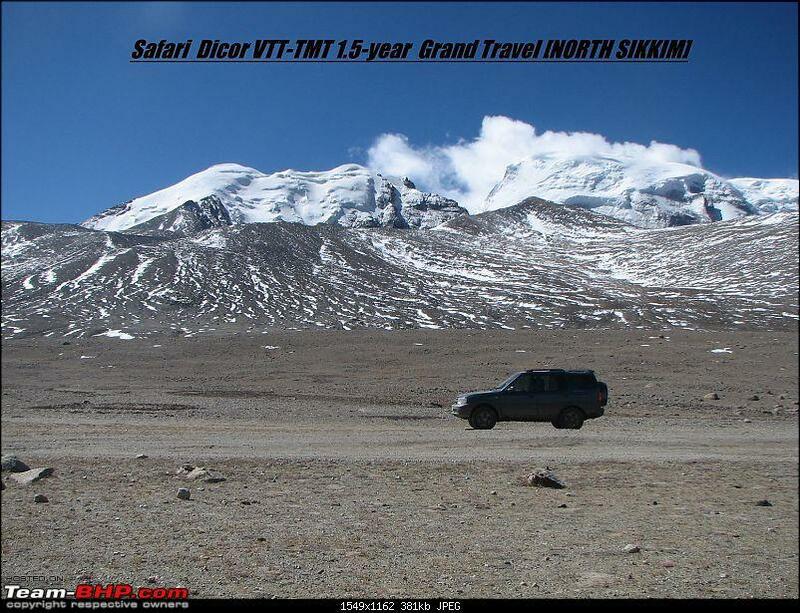 Amazed by the varied trips that you have undertaken and good to read that Safari passed the test. Good start to the thread with the down memory lane snaps. 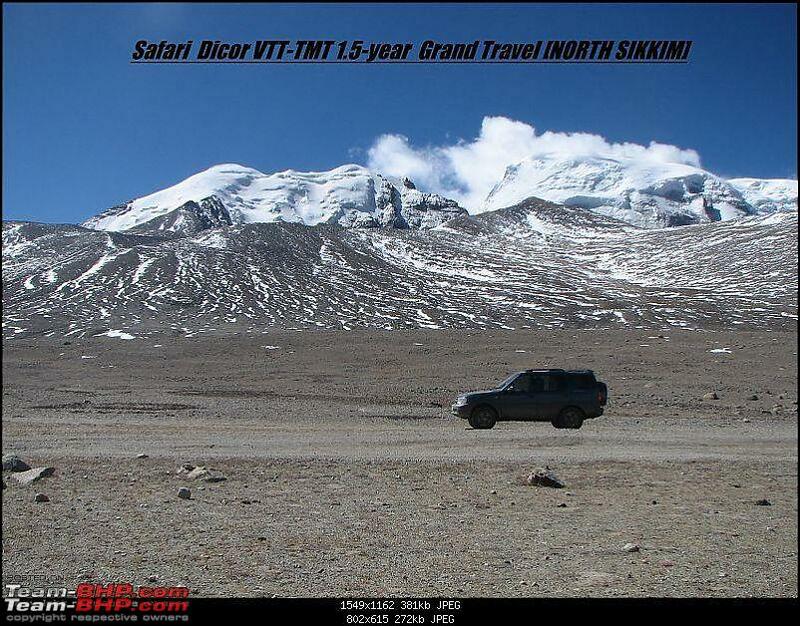 Safari VTT idling for continous 2 days and nights as we were stuck in it at Zojila top with frozen ice road with broken down axles and trucks. 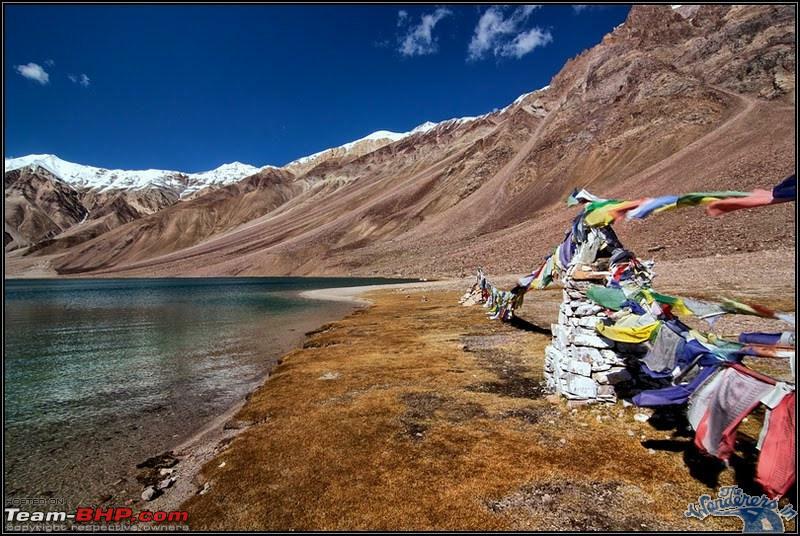 Chandra Tal [Lake of the Moon] at an altitude of about 4,300 metres (14,100 ft) in the Himalayas. 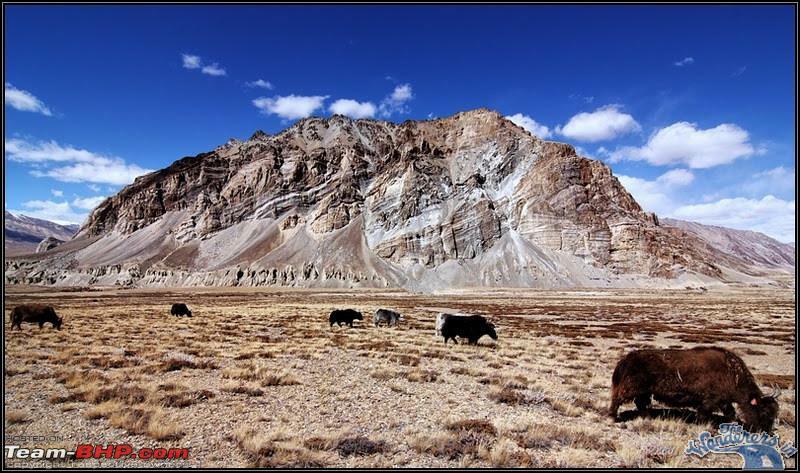 Grazing animals along the Man-Merak track and around Sarchu respectively. 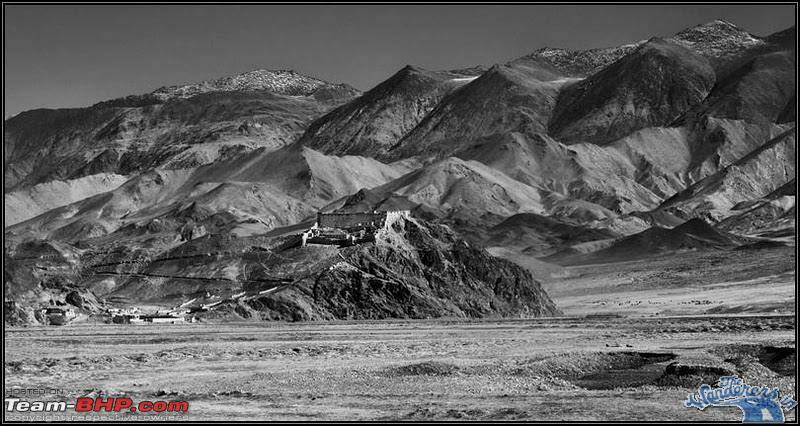 Monochrome of Hanle Monastery or Hanle or Analy Gompa is a 17th century Buddhist monastery of the "Red Hat" Tibetan Drukpa Kagyu branch of Tibetan Buddhism, located in the Hanle Valley. 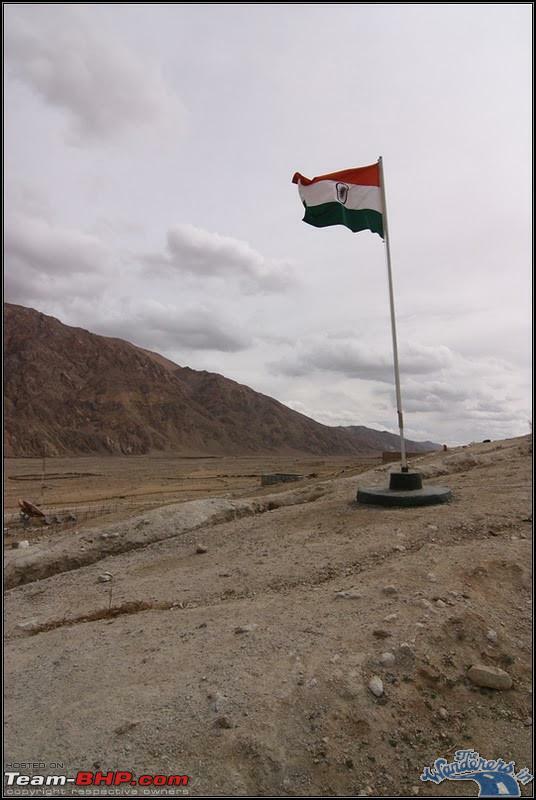 It is only 19 kilometres or 12 miles from the disputed frontier between India and Chinese-controlled Tibet. 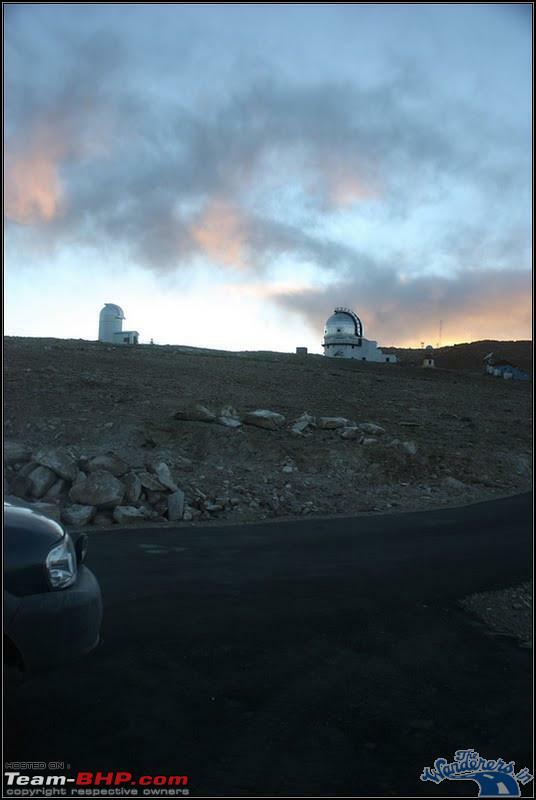 Indian Astronomical Observatory is also located at Hanle for its clear skies in most of the days of year. The telescope is remote controlled from Bangalore. A changpa nomad tent along the Loma-Fukche road, conditions are always harsh and as the cold winter season comes fast - it is impossible for most of us to fathom the adversity among which they live and stay all through the year. Last edited by adc : 26th May 2011 at 18:57. Simply FaNtAsTiC. The motivation has rubbed off but im not saying anything yet and you know why. Looking forward to the full episode. So what was the route sequence? This is the second log of Hanle that I have read (The first being from TSK). 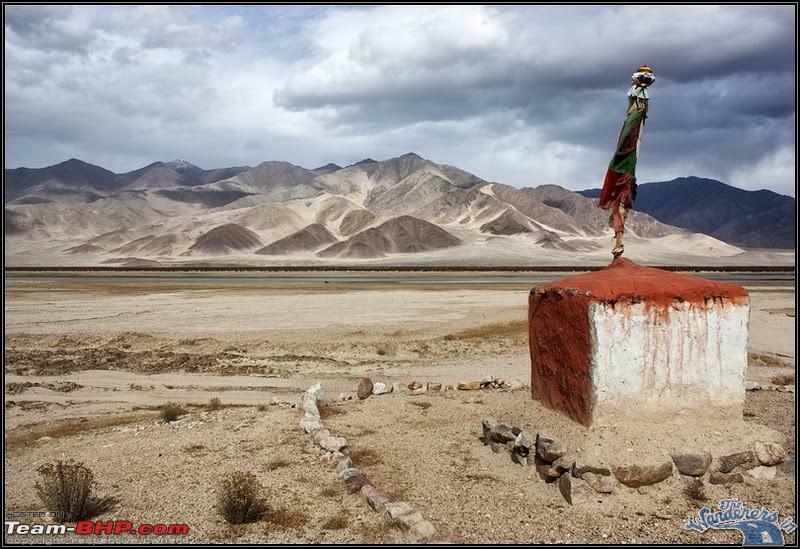 Question: Is there a route from Chandrataal to Pso Moriri and thus touching Hanle? Last edited by ampere : 26th May 2011 at 18:54. Last edited by AvonA7 : 26th May 2011 at 21:38. Kept us dangling for six months, you sadist. As penalty, you have to write the travelogue of your life. Amazing thread and great pictures. I am glued. Please keep it coming. A salute to your courage going out to the trip with a five year old. Didnt you add any additives to the diesel to prevent it from freezing? So you kept the car running for 03:3am till what time? I didnt know the Safari can idle non-stop for 2 days and still have fuel left over to continue the journey. Or did you have a fuel station close by on the way out? What camera and lens did you click those great pics with? All times are GMT +5.5. The time now is 04:40.